Sun is shining brightly and summer is blooming with the sea breeze, hot beaches, and beautiful sunsets. The last thing we want to bother with is coming fall. I get so frustrated whenever I spot yellow-orangish leaves falling down in late August. The temperature will drop and my lovely closet, full of light and colorful clothes, will slowly transform to a rectangular wooden box stuffed with boring items. My bed counter will no longer have sunglasses or the straw hat on it, they will be replaced by a How To Get Out Of Fall Depression manual. This year I am not going to give up on my cheer and enthusiasm, for there is a bunch of ideas I have to work on. 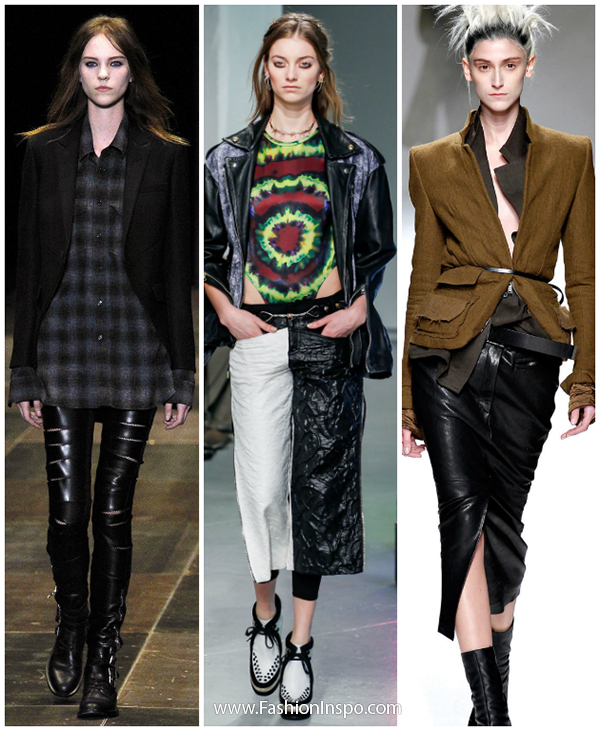 One of them is the hottest trend of this fall – grunge style. Join me on this exciting trip to the 80s and check out how to stay in a good mood when it is showering outside. Grunge is back! You don’t have to be a genius to draw this conclusion. 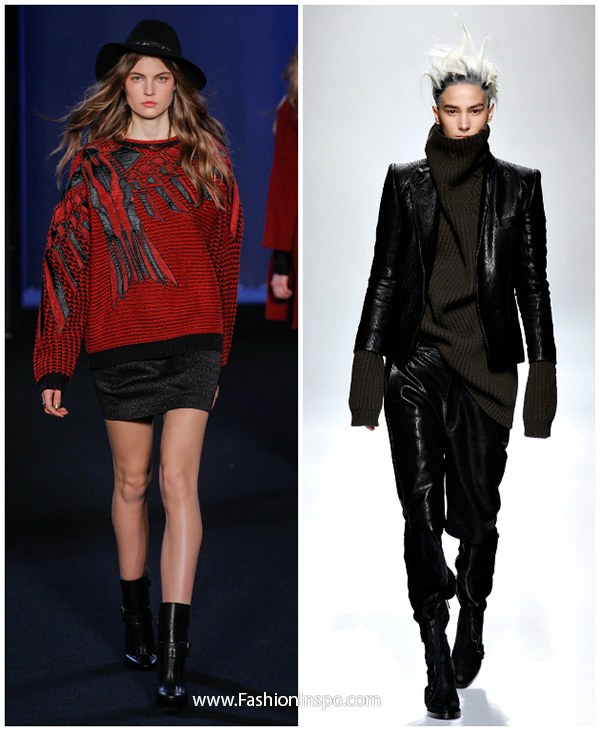 Fall 2013 collections of Zadig & Voltaire, Rodarte, Saint Laurent, Haider Ackerman, and Vivienne Westwood made it pretty clear. To be on trend this fall, we need to mix a hint of punk with a tiny bit of rock and add some heavy metal. A grunge look is a perfect way to draw attention to yourself without giving it all away. A black leather jacket is the grunge must-have. It is super practical and looks awesome with any outfit, be it a cute floral dress or ripped jeans. The jacket can be studded or decorated with zippers. If you think yours is lacking some accents, you can always improve the design with some jewelry pieces. Leather bottoms are also something you are going to need this fall. Yes, leather is a key word of the trend, but it does not necessarily mean that you should be dressed all in this material. Combine a leather maxi skirt with a denim jacket or a plaid coat, and you will look stunning! Leather pants will totally add that 80s flavour to your outfit. I am not a big fan of mesh stockings or any items with a fishnet pattern, but this is also a grunge essential. Pair them with a mini denim skirt or a lace dress and add some heavy boots – voila, you are ready to rock the dance club! Plaid dresses, skirts, or coats – anything your mom has in her special Nostalgia drawer will be an excellent find for you! Browse through her wardrobe and, who knows, maybe you will hit the jackpot! Oversized sweaters or long shirts belted on the waistline along with some leggins or those leather pants is another idea for your trendy fall look. It is an appropriate outfit to work in or hang out with your friends. Just make sure that your top is long enough to cover what you ought to cover. You can also combine big sweaters with pants or jeans. Biker boots or spiked shoes are adored by every girl. No wonder, they look gorgeous on any foot and with any clothing item you choose. A babydoll dress with some patterned tights and a leather or a denim jacket over – this is the grunge look I would opt for. Don’t forget about accessories – in this case the more the better. Various metal bangles, huge ring earrings, chunky chain necklaces, and chokers are what you need to complete your grunge outfit. I know it is too early now to worry about September, but a true fashionista always wants to be prepared and knows ahead what to wear. If you are looking for something to keep your mind busy, why not to start your search for stylish and vintage items to create a grunge outft? This way you will be looking forward to fall with excitement and trendy attitude.